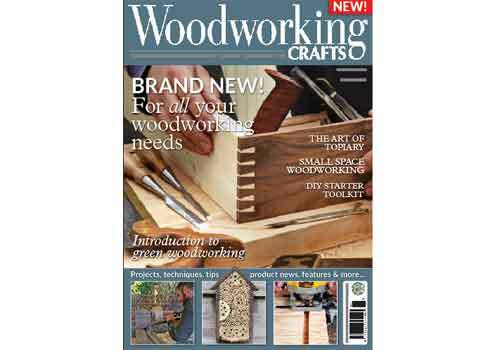 Welcome to the first issue of Woodworking Crafts magazine. It is indeed sad to say goodbye to Woodworking Plans & Projects, but do not worry as Woodworking Crafts has just as much inside, if not more! We now have new sections, including 'power woodworking', 'hand woodworking', 'community', and 'restoration'. In 'power woodworking', Mark Baker makes a whip-cord spinning top; Anthony Bailey looks at choosing router cutters; Simon Rodway has a neat design for a space-saving table; Bob Adsett makes a house number sign and Kathy Wise shows you how to make an intarsia Arabian horse using a variety of contrasting timbers. In 'hand woodworking', John Bullar makes a row of strong dovetails; Peter Sefton shares his woodworking diary; the Editor gives us a glimpse into his own DIY toolbox; we look at making a small-space workstation; a slab top coffee table as well as a natural-edge chopping board. In addition, Iain Whittington makes a DIY shed door; we examine the anatomy of a hand plane; Michael T Collins looks at how a selection of basic hand tools can be used to make a variety of traditional joints and Amber Bailey creates a stylish home accessory using wood veneers. We also have Louise Biggs restoring a walnut glazed cabinet in 'restoration' and Lee Stoffer tells us about going green in our 'community'. There's lots more for you to enjoy, including the latest news and events; a feature on the art of topiary; new 'Q&A' pages as well as our panel of experts sharing their favourite hints, tips and jigs. We also give you the chance to sign up to be one of our panel of product testers - just see details on page 56. In addition, there's also 'Kit and Tools', a sneak peek at our second issue and some 'design inspiration' for making chairs. All this and more in the first issue of Woodworking Crafts, so be sure to get yourself a copy, or why not subscribe and save up to 30%.